Obama was hated by the same people that adore Trump, even though the same criticisms apply. Remember when the Presidency was a boring, remedial thing? In those good old days, only geeks and wonks paid any attention to the goings on in the Oval Office, motivated either by genuine interest, partisan motive, or both. It’s hard to believe now, but once upon a time vast swaths of America had no idea who the President even was. The late night circuit found a reliable time-filler in “man on the street” interviews, invariably asking random passersby, “Who is the President of the United States?”, drawing much comedic relief from the outlandish replies. There were people out there who seemed to sincerely believe that Meatloaf was President. Or George Clooney. Or “Some black guy named Michael.” They had no idea, and that was fine. For a long time, the Presidency was safe. We cast our ballot every four years, and while we may have been disenchanted with the outcome, we were reasonably sure that the country was in capable hands. Not so anymore. In 2018 America, the Presidency is not in capable hands, and that isn’t a partisan statement. It doesn’t take an avowed leftist to conclude that Donald Trump is fundamentally unfit to serve as President of the United States. Despite this irrefutable fact, many on the right still cover for him. Trump is given a benefit of the doubt that was never extended to Obama, and yet Obama was (and is) reviled. He was a capable President, and the right’s disdain for his tenure still endures. Their treatment of these two Presidents highlights an abandonment of basic principle, and a level of overt hypocrisy, that should be universally abhorred, even as it’s widely accepted. Three short years ago, a well-considered, charismatic, and relatively boring man held the Presidency. He was the polar opposite of Donald Trump, in some ways to a fault. He had no personal scandals during his tenure, and only a handful of controversial professional ones. As far as Presidents go, Obama was a good one. That statement is blasphemy to most folks on the right, even in light of Donald Trump’s train-wreck of a tenure so far. 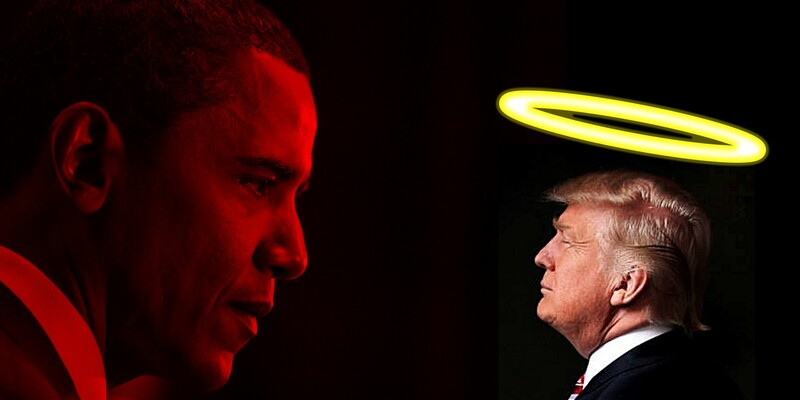 What they fail to consider is that nearly every criticism the right ever leveled against Barack Obama applies several-fold to Donald Trump. Obama was reviled as a tyrant and an elitist. He was regularly blamed for substandard policies abroad, particularly his handling of North Korea, Syria, and the broader Middle East. He was constantly cast as being weak on Russia, a notion proven in full by a hot-mic moment with Vladimir Putin in which he stated that he’d have “more flexibility” after upcoming elections. His administration often drew ire from conservatives, from the Fast and Furious weapons scandal to allegations that his IRS was unfairly targeting conservative groups — and on his orders. Obama’s Justice Department was decried as playing political favorites, giving birth to a plethora of conspiracy theories that bled into the 2016 election and are still whispered in certain conservative circles to this day. He was never credited with restoring the economy after the fallout of George W. Bush’s disastrous policies, and was single-handedly saddled with being directly responsible for decades of cumulative national debt. All of these criticisms apply to Trump in spades. In broad daylight, Trump is twisting the US Government into an authoritarian regime. He is, by definition, an elitist. His handling of North Korea is described by experts as ‘amateur hour’, and while his efforts in Syria and the Middle East have garnered some success, it has come at the cost of long-standing alliances that Trump has shredded with reckless abandon. He has not once said anything critical of Vladimir Putin, belying a strange subservience to Russia that is unheard of among modern Presidents — especially Republican ones. He has openly tasked his administration with targeting those who oppose him. He is under Special Counsel investigation for obstruction of justice, and continues to twist his Justice Department in ways that benefit him and his inner circle with sham recusals and overt efforts to obfuscate ongoing investigations. His economic decisions have been one massive blunder after another, the consequences of which are only now beginning to take hold. His escalating trade war with China and other nations, (some of them allies) can only broaden the economic fallout. He has signed budgets and tax cuts that have increased the national debt at a rate not seen in Presidential modernity, and unlike his predecessors, he has nothing to show for any of it. Donald Trump is the literal embodiment of the monster that Obama was made out to be by people who made fortunes on the premise that they were looking out for the welfare of the Union. The anti-Obama right spent the better part of a decade casting themselves as true patriots, sounding necessary alarm on Presidential overreach for the good of the country. How striking is their silence now? These voices of principle are no longer sounding the same alarms about Presidential overreach, despite the glaring authoritarian tendencies of Trump’s White House. Instead, they have become overt sycophants for their President, even as his antics become exponentially worse than his predecessor, whom they vilified and reviled constantly. Where have basic integrity and principles gone? If all of these things were wholly unacceptable under a Democrat, then why are they accepted, and even cheered by a Republican? The answer is tribalism. What’s bad for theirs is fine for ours. It’s political reality in 2018, but it’s also a pitiful excuse. If Obama’s tenure as President was a litany of unacceptable overreach and egregious failures, then Donald Trump’s is even more so. In vilifying one while accepting the other, many on the right are doing irreparable harm not just to the country and its Presidency, but to their own credibility — such as it is.